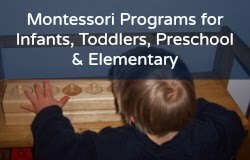 How to give a Montessori lesson on the Open and Close Using Zippers and Snaps activity for three-year-olds. Aim: a Practical Life activity for fine motor movement development and using a zipper and snapping. 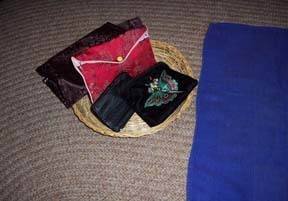 Materials: Four objects that zip and snap, a tray or basket to hold them, and a mat or small rug. If you have an older child who is 36 months or older, you can use six or seven objects. (The younger the child the fewer objects you want to use!) Objects you can use: a small make-up bag, a coin purse, a key holder, a lipstick holder (the kind that snaps and has a little mirror in it). This activity works best on the floor. Sit next to the child, place the tray on the left, and the mat next to the tray or on the right. If you are using a large rug, you can place the tray on the rug. 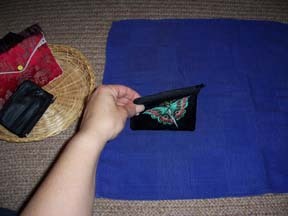 If you are using a small mat (as seen in the picture above) you can place the tray off the mat and to the left of the mat. 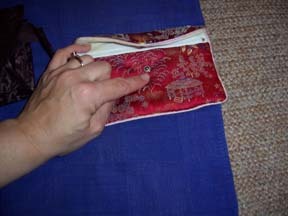 Take out one object using both hands, and place it on the mat (at the far left of the mat). Ideally you should have the objects placed in the middle of the mat, so as to have space to work on the mat at the bottom, which is easier for the child to reach (rather than the top). Zippers: Hold the object up (so the child can see the zipper) with your left hand and unzip it with your right (or your dominant) hand. Say, "Open." Now zip it back up and say, "Close." Place it back on the mat. 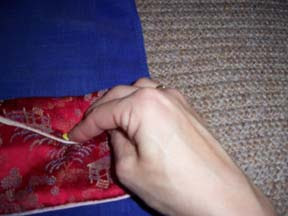 Take out another object using both hands, and place it on the mat (to the right of the first object--you are going from left to right as you place each object on the mat). Hold the next object (that zips) with your left hand and unzip it with your right (or your dominant) hand. Say, "Open." Now zip it back up and say, "Close." Continue with all the zipper objects. Snaps: Take out an object that snaps. Place it on the mat. Hold the object down with your left hand and unsnap it with your right or dominant hand. Say, "Open." To close it: Use your left pointer finger and place it just below the snap… use your right or dominant pointer finger and place it on top of the snap. Take your right or dominant thumb and pinch, hold the snap so the bottom of the snap and the top of the snap are on top of each other, and push the snap closed with your right or dominant pointer finger WHILE keeping your left pointer finger just below the snap--this serves as a marker for closing the snap as the child can no longer see the bottom of the snap as she is about to snap (it) closed. Practice it yourself several times! 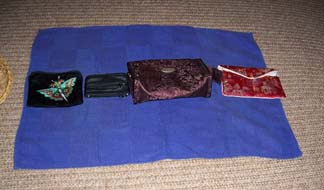 Continue with each snapping object until they are all lined up on the mat. Put everything back on the tray, from right to left, one at a time (a lesson in itself!). Now say to the child, "Your turn!" If you see your child having trouble, you can say, "May I have a turn?" and then show them again what to do.